Winner Of Singapore Wine Fiesta 2012 Giveaway!! You are here:Home » Promotion / Events » Winner Of Singapore Wine Fiesta 2012 Giveaway!! Featuring more than 60 international winemakers & over 250 labels at the event, one lucky reader will get walk away with A Pair Of Tickets Worth S$76 To Singapore Wine Fiesta 2012!! Jordan, please acknowledge this post within 48 hrs or another winner will be selected. Email me @ blackswanst@hotmail.com, your HP no. & Address for DBS to deliver your prize. Thank you again DBS Indulge, for sponsoring this Giveaway! 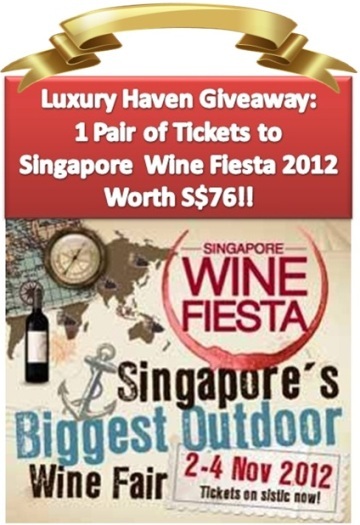 Read more about the event @ Win A Pair Of Tickets Worth S$76 To Singapore Wine Fiesta 2012!! Readers, thanks again for all your entries & stay tuned for the next Giveaway coming to you very soon! omg, I cannot believed myself !!! This giveaway event was actually genuinely REAL !!! Congras to your lucky winner! Congratulations to Jordan, you are the lucky one! Agnes, look out for my int'l giveaways! Guru, thks & have a good day! Congrats, Jordan. Enjoy your wine tasting session. DS, looks like gonna be fun! Kathy, thks & take care!